12. Suicide or desparate jump? There was a time when I used a time machine almost daily. My bicycle took me to the Arnhem Zoo chimpanzees and, in a way, five million years back in time, to the 'Age of unpolished stones'. Of course present day chimps are not our ancestors. But we do have ancestors in common. Around five million years ago they lived in the African rainforest. Some of them took to the savannas, started to walk upright, lost their hair, got bigger brains and ended up as modern humans. We have changed so much, that our present way of life tells us little about our distant past. 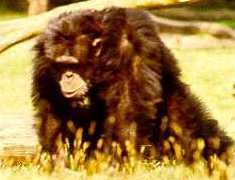 But, as Richard Wrangham and Dale Peterson argue (in 'Demonic Males'), present day chimps may provide better clues. The missing fossil, the ape that took the step form rainforest to savanna, might have looked a lot like present day chimps. Chimpanzees might have changed relatively little over the past eight to ten million years. They live in a conservative habitat, the warm, humid rainforest full of fruits. Looking at these apes, Wrangham and Peterson suggest, is like going back in time and catching a glimpse of our ancestry. Of course, Arnhem is not situated in the tropics and Arnhem Zoo is not a rainforest. Yet I often had the impression that my bike was a time machine, taking me five million years back in time when I went to the chimpanzee enclosure in Arnhem. After picking up the key at the entrance to the zoo, I went to the observation room next to the two-acre chimpanzee island. Having entered the observation room, I would open a few windows and wait for the chimpanzees to be released onto the enclosure by the keeper. After having greeted one another they would start another day, leading their own lives, comparable to that of their conspecifics in Africa in many ways. I would be able to observe their behaviour in detail. For several years, that was my job: observing and studying chimpanzees. My observations in Arnhem often gave me the feeling I was watching ancestors from a distant past at a time when, having eaten, their main interest is one another. March 1984. I arrive later than I am used to. It is unusually quiet. Nikkie is not with the rest of the group in the hall. The students can't tell me where he is. When I go looking for him, I see keeper Jacky Hommes walking on the island. She is all wet. "He is dead" she sobs, and it takes a while before I understand what happened. The morning turned out to be too cold for the chimps to go outside, so Jacky put them in one of the halls. Nikkie refused to enter the hall. He remained in the corridor, apparently eager to mate with sexually attractive female Krom. The jealous interest in her swelling had already caused a lot uf unrest in the last few days. Jacky decided to leave Krom in her night-cage to allow her some rest. Nikkie waited in vain, but refused to enter the hall or go back to his cage. When, a few hours later, the sun started to shine, Jacky decided to let Nikkie go outside. She pulled the sliding door to the enclosure. Immediately Nikkie ran outside at full speed. Without stopping he silently crossed the full length of the island, about a hundred meters. When he arrived at the moat, he jumped. In spite of his speed and the force of his jump, he did not make it to the other side. He sank like a brick. When a shocked Jacky bravely pulled him out of the moat a few minutes later, he had died. In vain, she gave him mouth-to-mouth resuscitation. Just to make sure, we walk over to Nikkie's lifeless body. There is no doubt possible: the most powerful chimpanzee of the Netherlands is dead. The rest of the group is still inside and could not see Nikkie's fatal jump. Yet, they are remarkably silent. I had noticed it when I came in this morning. The students, who did not know of Nikkie's fate, had also noticed it. Not a sound was to be heard, not even the scream of an infant. One way or another they had noticed that something peculiar had happened. Of course they had heard the sound of the sliding door and Nikkie going outside. After that, they must have heard people on the island and they know that there never are people and chimpanzees on the enclosure at the same time. In the weeks following Nikkie's death, there is a lot of attention from the media. As if a head of state has passed away. The headlines are clear: Ape throws himself off rock, Tormented Ape-king commits suicide, Ape drowns himself, Power struggle in Burgers' Zoo. 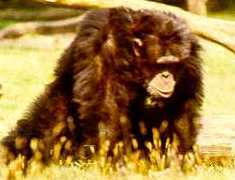 Nikkie, "the uncrowned king of the chimpansee-people" was supposed to have killed himself by throwing himself, bang into a deep moat. A "flight into death" caused by two conspiring subjects. That is news. An ape committing suicide. A phenomenon thought uniquely human occurs in the animal kingdom. Time and again I explain what really happened. 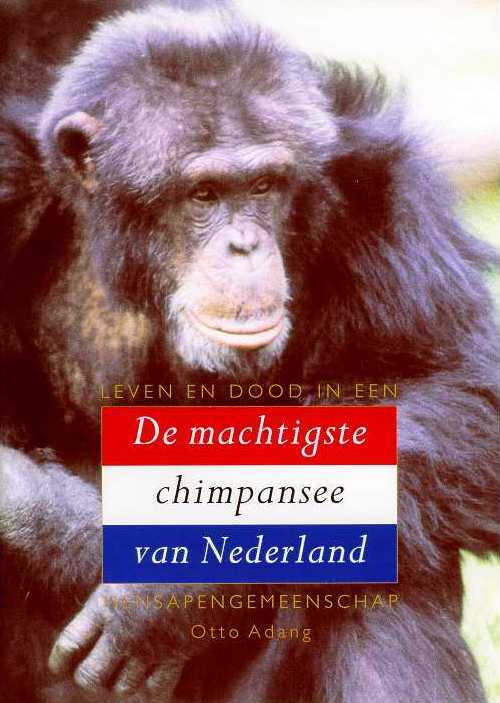 I sketch the previous history and tell the story about the most powerful chimpanzee of the Netherlands. An alpha male, who could only be the most dominant by co-operating with another male. Nothing special as far as chimpanzees are concerned. An alliance that is broken. Nothing special either. A rival conspiring with a former ally. By this time a familiar story. In Africa, a dethroned alpha male would avoid his rivals for a while and leave fot the periphery of their community area. That is not possible in Arnhem, but the past has shown that a former leader can well adjust himself to the new situation and stay in the group without problems. An unfortunate coincidence has led to a situation in which Nikkie must have felt extremely threatened. And this time he did not seek refuge in a tree, as he usually would have done. I think that, in a moment of panic, he tried to jump across the moat. A year before he had done so succesfully, so why should he fail this time? When Nikkie went outside, he must have thought that the rest of the group would follow and might go after him. There is no reason to suppose that Nikkie wanted to die. He did not commit suicide, but made a panicky, desparate jump. He wanted to get across, but failed. To demonstrate the reaction of the chimps to a predator for an audience of interested scientists, Matthijs Schilder from the University of Utrecht put on a panther's mask. When his masked head suddenly became visible to the chimps, they reacted furiously (as we know they do since Adriaan Kortlandt conducted experiments in West Africa in the sixties). Barking and screaming, the chimps rushed to the side of the moat and threw sticks and stones at Matthijs, who had to duck repeatedly to avoid being hit. To achieve maximal effect, he would show up again from time to time, making frightening noises. When the intensity of the chimps' reactions had finally died down, Matthijs stood up and put off the mask. It was a false alarm, the apes were fooled. All chimpanzee eyes stared at Matthijs. Mama's reaction was remarkable. Her face had a clear bared-teeth grin, sign of insecurity. Slowely but surely, the expression on her face changed: her lips covered her teeth, her mouth went half-open. Mama laughed! Very clearly she sustained the facial expression chimpanzees use during social play, a play face.Apparently, she could appreciate the joke. The Arnhem chimpanzees spend the winters indoors. Each morning, after cleaning the hall and before releasing the colony, the keeper hoses out all the rubber tires in the enclosure and hangs them one by one on a horizontal log extending from the climbing frame. One day Krom was interested in a tire in which the water had been retained. Unfortunately, this particular tire was at the end of the row, with six or more heavy tires hanging in front of it. Krom pulled and pulled at the one she wanted but could not move it off the log. She pushed the tire backward, but there it hit -the climbing frame and could not be removed either. Krom worked in vain on this problem for over ten minutes, ignored by everyone except Otto Adang, my successor in Arnhem, and Jakie, a seven- year old male chimpanzee to whom Krom used to be the "aunt" (a caretaker other than the mother) when he was younger. Immediately after Krom gave up and walked away from the scene, Jakie approached. Without hesitation he pushed the tires off the log one by one, as any sensible chimpanzee would, beginning with the front one, followed by the second in the row, and so on. When he reached the last tire, he carefully removed it so that no water was lost and carried the tire straight to his aunt, where he placed it upright in front of her. Krom accepted his present without any special acknowledgment and was already scooping water with her hand when Jakie left. Inasmuch as cooperation is widespread in the animal kingdom, the tendency to assist a member of one's own species is nothing new or original. Yet the precise intention behind it changes as soon as the actor can picture what his assistance means to the other. It is hard to account for Jakie's behavior without assuming that he understood what Krom was after and wished to help her by fetching the tire. Perspective-taking revolutionizes helpful behavior, turning it into cognitive altruism, that is, altruism with the other's interests explicitly in mind. Chimpanzees do not only use tools, they make them as well. In Africa, they pull leaves off a twig to be able to fish for ants and termites. They chew on leaves to turn them into a sponge. Although they use stones to crack nuts, it has never been observed for chimpanzees to modify stones to make more suitable tools. They really live in the 'age of unpolished stones'. Matsuzawa (1994) referred to the use of a 'metatool' when he saw a chimpanzee use a stone to support another stone used as an anvil in nutcracking. This is the most complex tool use observed in the wild. 'Indirect' tool use is something special: it has never been observed that a chimpanzee used a tool to make another tool, but Jonas (aged ten) came close. Jonas had the habit of throwing sticks into protected trees (in Arnhem most trees are surrounded by electric wires to protect them from the chimpanzees) to throw leaves and small branches with leaves attached to eat out of a tree. To achieve good results, use of the right kind of stick not too long, not too short, not too heavy, not too light seemed important. Jonas became very skilled and was able to eat many fresh leaves. Sometimes, a stick would get caught up in the tree. In that case, Jonas would simply find a new one and continue. But not every stick was as good as another. When the second stick seemed to be less suitable, he would not use it to throw leaves out of the tree, but to regain the first one. At least, that was the impression I got. But the first stick and new fresh leaves were next to one another, high up in the tree, so there was room to doubt this interpretation. One day however, Jonas was busy getting leaves out of a tree next to the moat and the inevitable happened. The stick fell into the moat, out of Jonas's reach. And it was such a good one, responsible for a high succes rate. What did Jonas do? He went to look for another stick and used it to get the first one out of the moat. In other words: Jonas used a tool to get at another, more suitable tool, a form of 'indirect' tool use.